Lately, the User experience design subject has been on fire, it’s been around for a while now but its development is in constant evolution. We live in a new era of conception and creation where humans are put at the center of every reflexion, and to make their experience memorable, their interaction with the product or interface should be designed in a way that responds to their needs and solves their problems. What does the UX design actually mean? It’s a process aiming to enhance the user satisfaction by improving the usability, accessibility and pleasure provided in the interaction between the user and the product or website. It describes a collection of activities that you do in order to create experiences for users. UX design considers who your customer is, what their challenges are, how can you solve them. Why is UX design so important? UX design gives you the opportunity to understand deeply the users in order to solve their problems and elevate your design beyond its aesthetical function. From studying the users behaviour, asking questions about their preferences, you can create the best experience at the moment of the interaction with your website. UX Design goes beyond a virtual interaction. It can create lasting experiences in real life too, in a way that can change people way of doing some things. Great design should reach people in crucial areas of their lives like communicating with relatives or capturing memorable moments. By using UX design, your focus is more on people and how to improve their lives through technology. What you offer to the users can make an impact on their daily life, which will make your brand hard to forget. 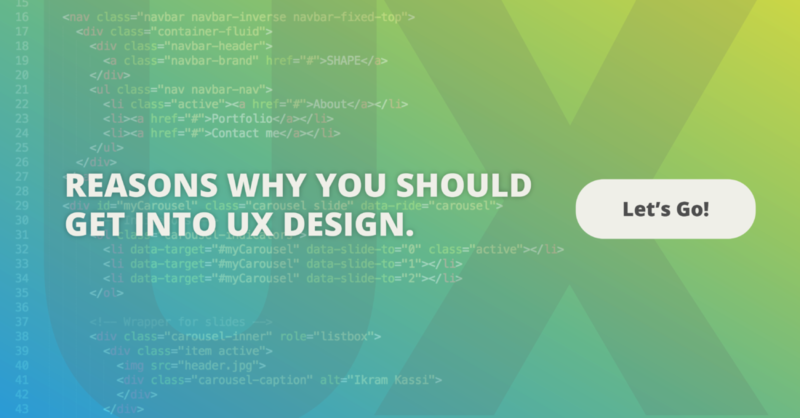 You conversion rates up when you have an efficient UX design. Conversion in when visitors are turned into customers. When your design responds to the visitors needs and responds to their problem, they can likely purchase. When your goals are set and your audience is well studied, it will influence your content. By knowing what users are looking for, you are more likely to present relevant and interesting content. The main reasons why people go to a website is to get immediate information. If your audience doesn’t find answers in your content, they will look for it somewhere else. At SHAPE, our objective is to help you fulfill your users needs, by defining you customers journeys that are more conducive to business success. We put the user at the center of our reflexion and creative process. You like this article ? Don’t hesitate to share & comment below !